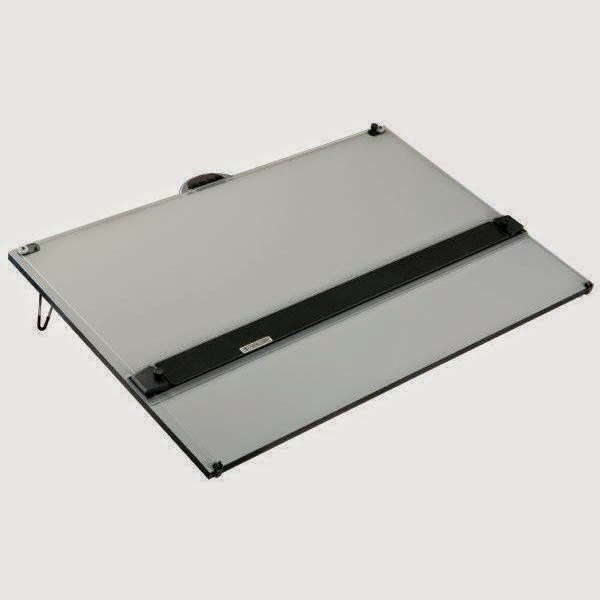 At Drafting Steals we offer high quality drawing boards, they have a white surface that is made from melamine, and covers a high density warp free particle board. The straight edge bar on the boards is made of aluminum, and has acrylic edges. They also feature a handle and legs for simple transport and convenience. The PXB Parallel Straightedge Board comes fully assembled and ready to use. With its compact body and laminate drawing space it provides a professional work surface in an easy, transportable unit. This board features spring-loaded hardware that is capable of holding vellum, cardboard, or paper. There is also a raised reinforcing bar that provides added support and stability. The straightedge and straightedge lock this board features eliminates the need for a T-square, and allows you to draw lines with ease and precision. The straightedge also includes knobs that can adjust the fine tuning parallelism, this comes in handy when switching boards to start a new project. This board is perfect for students and professionals alike, and for any work or hobby that requires drafting or drawing. With all the convenient features this product has to offer work can be made easy, fast, and comfortable.